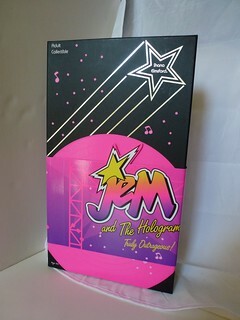 Shana Elmsford was the most talented of the Holograms. 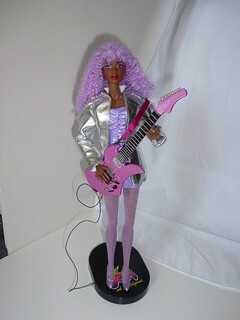 She was their drummer, fashion designer, and bass guitarist… and yet she always remained down-to-earth and modest. If anything, she was TOO modest, with several episodes hinging on her lack of confidence. 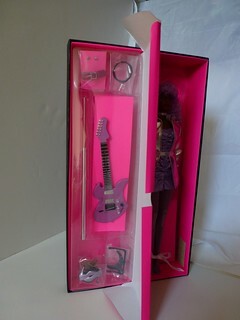 Her accessories include a pair of earrings, a pair of pumps, an extra set of hands, stand parts, her bass guitar, and a strap for the guitar. While I can understand that they couldn’t include her drum set (perhaps a drum set accessory pack might be coming in the future, along with the last Hologram, Raya?) but the lack of fashion sketches was mildly disappointing. On the other hand, Shana’s face and make-up are absolutely amazing. 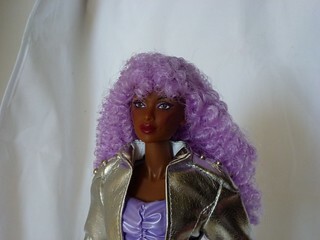 I’d noticed that Jem and Kimber had rather toned-down versions of the glam make-up from the cartoon and toy line, and I was beginning to wonder if Integrity had to make things a little tamer to appeal to more conventional doll fans. But Shana! Wow! It’s a little hard to tell in this photo, but in person she has beautiful star-like patterns under her eyes as well as the splashes of color on her cheeks. It’s wild and subtle at the same time. Shana’s face sculpt also has some great personality, with a little dimple on one side. It’s an understated way of communicating her sweet personality without giving her a big grin or simpering smile. One of my biggest concerns with Shana was her hair. In the cartoon, Shana has a unique hairstyle that’s vaguely lemon-shaped. 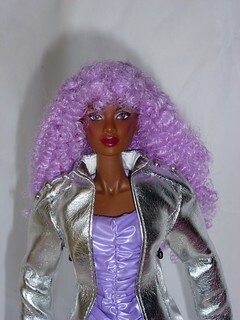 Integrity has translated that into “curly hair that spreads out towards the bottom”. 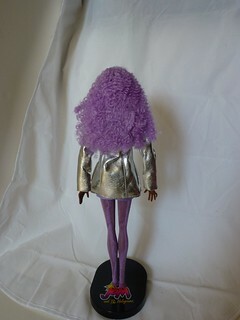 As with the other dolls, the back of her hair is flattened and a little stiff from all the styling product… but I was able to fluff it up a bit with care. A dedicated fan could probably style and trim Shana’s hair into a more cartoon-accurate style with ease. I’m happy with her current look, though, so I’ll leave it be. Shana’s outfit is definitely one of the most elegant and classy in this line, and it suits her very well.